Most of us work standard 9 to 5 jobs, which means our workouts have to be either before work early in the morning or after work at night. Both of these options pose huge safety risks to runners. It's dark, which poses the risk that you won't be seen by drivers. In fact, over 122,000 runners are hit by vehicles every year, which can lead to serious injuries and death. It also leaves you vulnerable to attacks: almost all runners (especially female runners) have terrifying stories of being stalked, followed, harassed, attacked, and even killed while running at these times. Knowing these risks, a smart runner will take precautions in order to avoid injury and dangers. We're going to go over some of the most important running safety gear that you should own before running in the dark. Just because you think you're visible to cars doesn't mean you are. You need to take precaution by wearing clothing especially made to make you visible. While these might not be the most fashionable items, you're running in the dark anyway so it doesn't really matter. And is wearing cute black leggings instead of safety clothing really worth getting hit by a car over? We didn't think so. Look for running clothes that are made with bright and reflective colors and additions that will make you visible to cars even in the dark. This can be in the form of visibility vests, reflective sneakers, hats, gloves, shirts, etc. Almost all aspects of your running outfit can be made with visibility in mind. 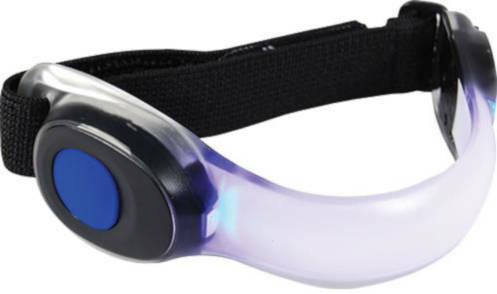 You can also carry a safety light to improve your own vision and your visibility to others. These lights are bright and flash in a pattern, which will make you visible to vehicles even at night. They're also made in small sizes so they aren't bulky or annoying to bring with you on a run. They even have ones made specifically for runners to wear around your arm so you don't have to carry it at all. This will also help you see where you're going. When it's dark outside, it's easy to trip and injure yourself while running. Prevent that by running with safety lights. When you run with headphones, you can't hear whether there are cars near you or whether an attacker is approaching you. You need to be alert and aware of your surroundings, which is almost impossible when wearing headphones. If you like to run with music, consider running with a small portable speaker instead. This will play music, but also free up your ears to listen for approaching vehicles or people. You probably already bring your phone with you on runs, but if you don't, consider these reasons why it's one of the most important pieces of running safety gear. If you need help on your run, you'll have access to emergency services through your cell phone. This is especially important if you run in more remote areas not near people or away from access to others. Before you go on a run, have your significant other, roommate, friends, etc track your phone through a tracking app. This way, they'll be aware of your location at all times in case you need assistance. They can also see if you stop moving for a long period of time and come to your aid. Imagine you're injured and unable to use your phone: whoever is tracking you will see that you've stopped moving, know your exact location, and can come to help you without you having to do anything. Road ID is essentially a "beefed up" tracking app. It allows family or friends to track you on your route, but it will do more than just show when you stop moving. If you stop moving for more than 5 minutes, or if you aren't responsive to an SOS that you can send within the app, it will message contacts within your phone. It will automatically contact whoever's number you put in whether that's your mom, your significant other, your roommate, etc. This app is also free. The apps we've gone over so far require you to have a smartphone. But what if you're one of the few who doesn't have a smartphone? Kitestring is the app for you. It's actually run through the Internet, so you can use it with any device. You simply set it up with your phone number, and it will periodically send you messages throughout your run. If you don't respond to those messages, it will send an emergency message to pre-chosen contacts (similar to Road ID). You can do this through any cellular device, not just a fancy smartphone! Perhaps you want something a bit louder or more powerful than your phone's speakers when it comes to a personal safety alarm, you can get a separate alarm device. Consider getting a small one that can attach to a keychain to make it easy for you to bring on a run. Then all you have to do is press a button and a loud alarm will sound alerting those in the area that you need help or that you're in danger. 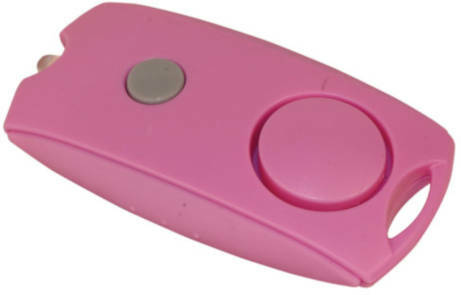 You can also get safety alarms that have mace spray built into them for a two-in-one piece of safety equipment. Most of what we've gone over so far have been about prevention. Getting visible to prevent an accident, installing apps to protect you, ditching headphones so you can be aware of your surroundings, safety alarms, etc. But what if the worst happens and you find yourself being attacked? That's where something like pepper spray comes in. This self-defense weapon is easily portable while running and easy to use quickly without much training. You simply spray it in the face of your attacker to instantly stop them in their tracks. This will give you enough time to run away, or at least to call the police. And don't think that these have to be huge cans that you have to carry for miles. 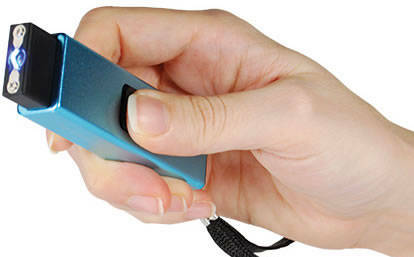 Pepper spray for runners comes in small keychains that you can easily attach to your keys for easy transport and access. Pepper spray is legal in all 50 states, but there are some specific pepper spray laws in certain areas and jurisdictions you should be aware of. If you feel more comfortable with a weapon on you instead of just pepper spray and alarms, that's your decision. Just be smart about what you're bringing. Remember: this is for when you're going on a run. You can't have something bulky or heavy that you can't operate on the go. Consider a small portable stun gun or taser. These are easy to operate and can be a significant help during a situation where you're being attacked. They'll stun your attacker which will give you time to call for help, run away, or find another person around you. Running with a buddy or with a group is one of the simplest (and cheapest!) running safety tips. While this isn't technically "gear", when you combine it with everything we've gone over, your running safety gear list is complete. Running with someone else will increase both of your awareness of what's going on around you. Maybe one of you sees an approaching car while the other got distracted by a pain in their leg and didn't notice, for example. You're also much less likely to be attacked if you're with someone else vs running alone. But only 6 percent of people run with a partner. Change that and add a friend to your "essential gear" list. Adding some of these running safety gear items to your collection will increase your safety no matter what time you're running. While they're especially useful for solo or dark runs, you can never be too careful. Try to prevent your chances of being attacked or hurt with the preventative gear items we mentioned as well as following the rules of the road. Want more information before you purchase something like pepper spray? Check out this article for more info.